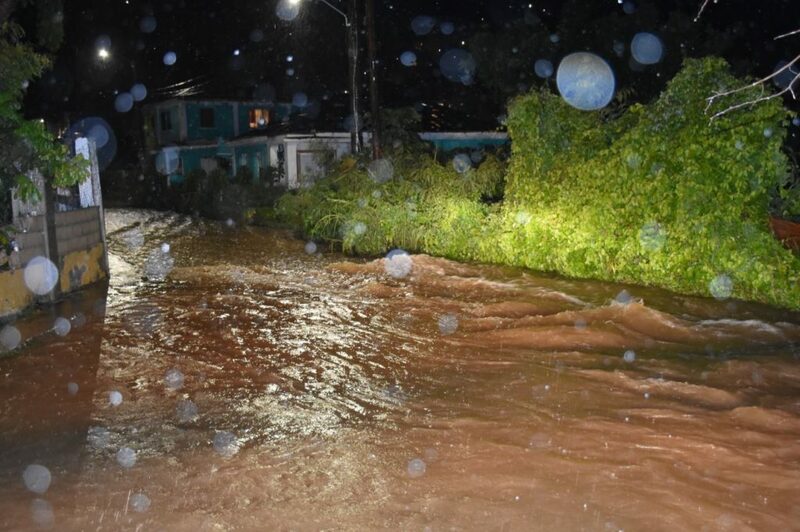 The BVI experienced a considerable amount of flooding Thursday night from a tropical wave that was affecting the area. Authorities have not given any official word on the height of the waters which were dumped during Thursday’s heavy rains. But, flood waters climbed at least a few inches in certain sections of the territory. Purcell Estate and Sea Cows Bay on Tortola were observed as one of the areas that received what can be described as notable flooding. However, up to press time, there were no known reports of property damage as a result of Thursday’s heavy rains. 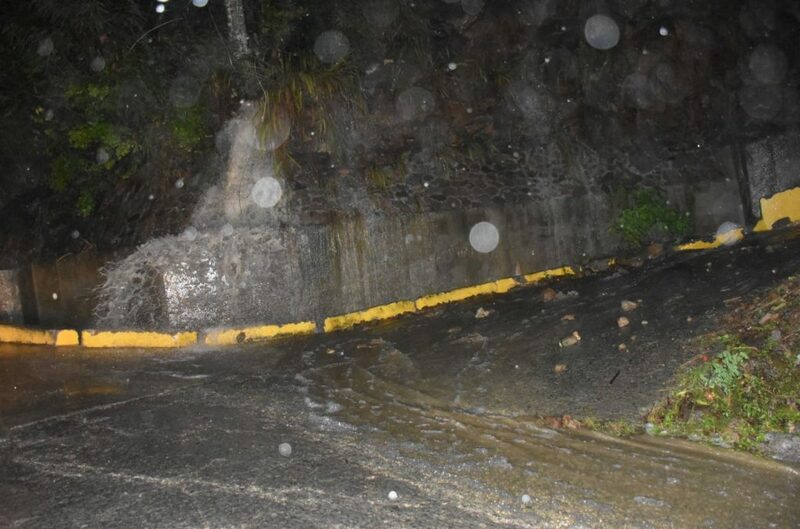 The waters, however, deposited rocks and soil on some sections of the territory’s roadways. The Antigua and Barbuda Meteorological Service had issued flash flood advisory at 4pm on Thursday. The said meteorological office has now forecast improved weather conditions for Friday, August 31. The meteorological office said there is a moderate chance or showers for Friday and a slight chance of showers for Friday night. Scenes from the heavy showers on August 30. Improving the drainage infrastructure is another high priority item for the BVI. 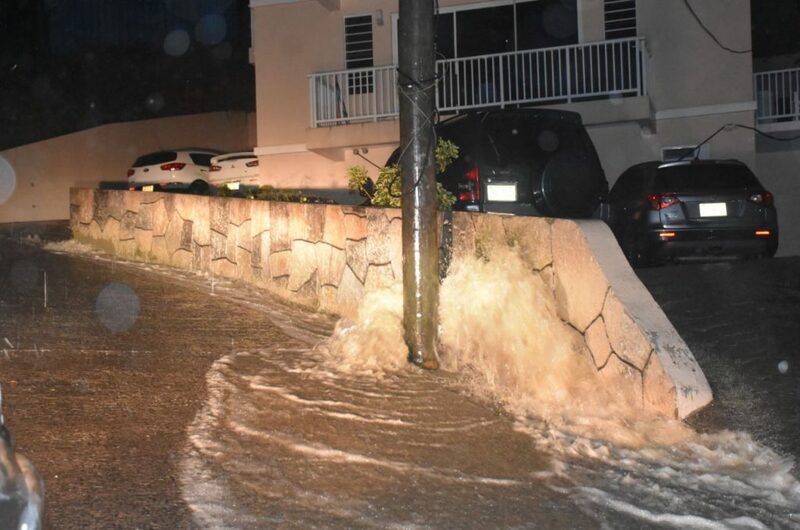 Increasingly, nuisance flooding is becoming a problem in the VI, impacting residences, businesses, roads, traffic ……etc. Does it seems now that whenever a cloud makes up the BVI floods? The question is what is causing the increasing flooding and how to mitigate it? A simple way to answer what is causing the flooding and how to mitigate it is following a rain drop or rain drops. When rain falls, some of it falls on leaves and evaporates, on roofs and typically runs off to the ground, infiltrates into the ground and runoff . It is the portion that runoff that causes flooding. Rain moves from a higher elevation to a lower elevation, ie, from up hill down hill. In a drainage basin (watershed), runoff is channeled into ghuts, ditches, creeks, streams, rivers ……..etc created by nature on its way generally out to sea. Interruption of this flow can result in flooding, ie, blocking ghuts, poorly maintained ghuts…….etc. Further, growth produces more hard surfaces, resulting in less runoff infiltrating into the ground, larger volume running off at a greater velocity. Poor drainage planning results in areas that didn’t flood before development flooding after development. Moreover, to mitigate the increasing flooding, a drainage system (ghuts, pipes, ditches, inlets, manholes, catch basins, culverts, bridges….etc) must be designed and constructed to collect and convey runoff safely out to sea. The system should be designed to handle frequent rain events, ie, 2-year, 5-year, 10-year…….etc, along with less frequent rain events, ie, a 100- year rain event. What does a 100-year event means? It theoretically means that a 100-year rain has a 1% chance of occuring every year; nonetheless, the reality is that a 100-year rain can occur at any time. Will a well-designed and constructed drainage system solve the flooding problem? No. A well-designed and constructed system that is poorly maintained could result in flooding. The drainage system should have a maintenance plan; the system should be continuously inspected and maintained periodically, ie, monthly, quarterly or more frequently as needed. Flood-prone areas should be inspected and maintained more frequently; they should be inspected and maintained as needed with the 1) forecast of heavy rainfall and 2)after a heavy rainfall. Further, an engineering evaluation should be conducted on Wickhams Cay and other low lying areas on Tortola and outlying islands to ascertain if a drainage pump station(s) may be needed. “E”, can you let us know WHY only you can see the problem and not the “educated” leadership? @Ausar:”“E”, can you let us know WHY only you can see the problem and not the “educated” leadership?” Assuming that your are referencing my comment, I’m confident that I’m not the only one that sees the drainage problem. There are numerous trained and experienced civil engineers that call the VI home. Growth and development seemed to have outpaced the drainage system. All is not lost though. The planning, programming, budgeting…etc must be put in place to catch up with and stay out front of growth and development. Effective drainage must be an integral part of a National Development Plan that must be adhered to and executed by all governments. Improving the drainage infrastructure is another high priority item for the BVI. Increasingly, nuisance flooding is becoming a problem in the VI, impacting residences, businesses, roads, traffic ……etc. Does it seems now that whenever a cloud makes up the BVI floods? The question is what is causing the increasing flooding frequency and how to mitigate it? A simple way to answer what is causing the flooding frequency and how to mitigate it is following a rain drop or rain drops. When rain falls, some of it falls on trees/leaves and evaporates, falls on roofs and typically runs off to the ground, infiltrates into the ground, and becomes surface runoff . It is the portion that runoff that has the potential to cause flooding. Rain moves from a higher elevation to a lower elevation, ie, from up hill to down hill. In a drainage basin (watershed), drainage runoff is channeled into ghuts, ditches, creeks, streams, rivers ……..etc typically created by nature or man-made on its journey generally out to sea. Interrupting this drainage pattern/flow can result in flooding, ie, blocking ghuts, poorly maintained ghuts, redirecting traditional drainage flow with undersized drainage channels, filling existing ghuts without putting in place a substitute flow path(s)…….etc. Further, growth produces more hard surfaces, ie, roofs, parking lots, roads, driveways, sidewalks……etc that result in less runoff infiltrating into the ground and a larger volume running off at a faster velocity. Poor drainage planning results in areas that didn’t flood before development flooding after development. Moreover, to mitigate increasing flooding, a drainage system (ghuts, detention and retention ponds, pipes, ditches, inlets, manholes, catch basins, box culverts, bridges….etc) must be designed (effectively sized) and constructed to collect and convey runoff safely out to sea in a timely manner. Additi9naly, the system should be designed to handle frequent/routine rain events, ie, 2-year, 5-year, 10-year…….etc rain events, along with less frequent rain events, ie, a 50-year, 100- year…….etc. rain events. What does a 100-year event means? It theoretically means that a 100-year rain has a 1% chance of occuring every year; nonetheless, the reality is that a 100-year rain can occur at any time. It is important to note that it may be cost prohibitive to construct a drainage system to safely facilitate any draiange event, ie, 500-year rain event . Will a well-designed and constructed drainage system totally solve or reduce the flooding problem? Not necessarily. A well-designed and -constructed drainage system that is poorly maintained could result in flooding. The drainage system should have an aggressive and proactive maintenance plan; the system should be continuously inspected and maintained periodically, ie, monthly, quarterly, bi-annually, annually or more frequently as needed. Flood-prone areas should be inspected and maintained more frequently; they should be inspected and maintained with 1) forecast of heavy rainfall and 2) immediately after a heavy rainfall. Drainage maintenance should be an integral part of Public Works annual maintenance and operations budget. Further, an engineering evaluation should be conducted on Wickhams Cay and other low lying areas on Tortola and on outlying islands to ascertain if a drainage pump station(s) may be needed. Defining the difference between hydraulics and hydrology can be confusing. Hydraulics is the physics of water, ie, the conveyance of water in pipes, pressures in components……etc; whereas, hydrology is about geography and geology, ie, water cycle…..etc. Nonetheless, hydraulics and hydrology are the province of engineers, ministries …etc. Residents care about flood waters flowing into their homes and businesses and spreading and ponding on roads. Of late, there are more serious flooding in the territory. What is causing the increasing incidents of serious flooding? For the most part, growth and development, coupled with poor drainage infrastructure planning, design, construction and maintenance, contribute to flooding. Like water and wastewater, stormwater is the third leg of the water triangle. As such, it must be treated as a utility with the same attention, investment, care and feeding …….etc as its brethren water and wastewater. In the VI, the only precipitation that has to be concerned about is rain. Thus, it must be effectively managed from the time the first drop hits the watershed to the last drop that is discharged into the sea. In big countries, surface runoff can take days, weeks, months or even years to reach the sea. 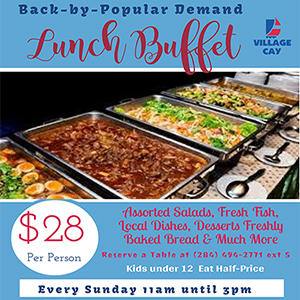 However, in a small territory like the BVI, it takes less than an 60 minutes for runoff to roar down Great Mountain Ghut, Long Bush Ghut, Johnson Ghut……etc. These ghuts must be kept clean and unobstructed. A permit should be required to fill in any ghut; this is to ensure there are proper work around or diversion of flow. Moreover, in low lying city(s) and residential areas, a drainage system must be designed and constructed to collect, convey and discharge surface runoff out to sea. Additionally, the system must be designed and constructed to prevent and/or minimize the “spread” on two lane roads (one lane in each direction) that are standard in the BVI; minimizing the spread is essential for smooth traffic flow. Further, roads must be designed and constructed to prevent “ponding” on roads; ponding accelerates road deterioration, increasing ownership cost.